We are proud to announce we celebrate the Jubilee Edition of the Singelswim Utrecht! Please be invited and swim along with us on Sunday, June 16th, 2019. We will finish at the festive location at Park Lepelenburg. 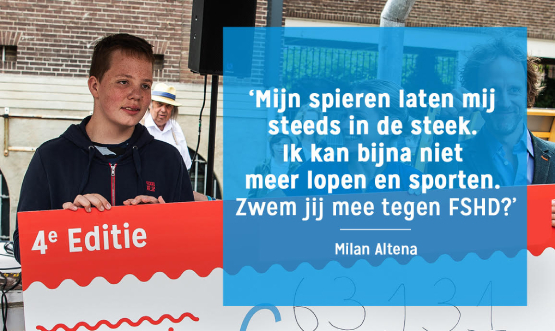 All heroes swim 1.2 or 2 km in the historic Utrecht Singel to raise money for research on a cure and treatment for FSHD muscle disease. This disease causes to vanish your muscles possible already from a young age. So far noncore or treatment are available. That’s why your help is so needed, and much valued! We call on everyone to participate. Keep an eye on this site because a lot is about to happen and it will be spectacular. We can already reveal that Mayor Jan van Zanen has become an Ambassador and is swimming with us. 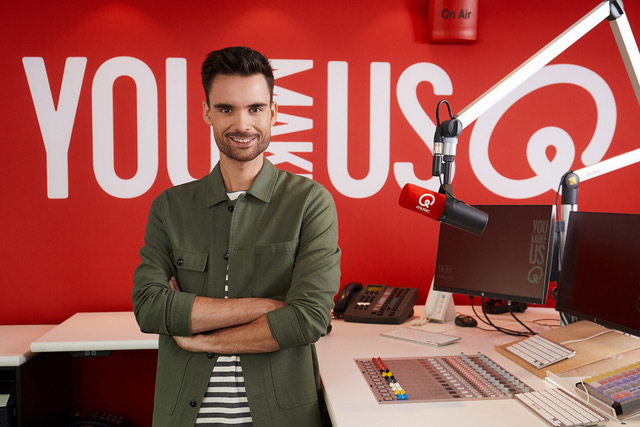 We are also very proud that the Utrecht DJ Domien Verschuuren of Qmusic is going to swim for a good cause! Facioscapulohumeral muscular dystrophy is a heritable muscle disease, often called FSH or FSHD. (It is also known as Landouzy-Dejerine disease, after the two French neurologists who first documented it in the late 19th century). Its major effects are progressive weakening and loss of skeletal muscle. It has significant medical and health impacts on individuals, families, and society. FSHD is amongst the most common forms of muscular dystrophy, affecting children and adults of both sexes. In the Netherlands, around 2,000 people suffer from the disease. The cardinal feature of FSHD is the progressive loss of muscle strength. The name of the disease originates from the typical pattern of weakness at onset: the face (facio), shoulder girdle (scapulo), and upper arms (humeral). However, the disease can differ in the typical initial pattern of weakness - not every patient experiences facial muscle loss, and many develop muscle weakness in the legs and torso. The symptoms can develop at any age, from infancy through to old age. Many patients recall being unable to whistle, smile, or close their eyelids as a child. The majority of males are diagnosed by age 20, and females by age 30. About 4 percent of cases are diagnosed in children under the age of 5. These early-onset or infantile-onset (iFSHD) patients are at greater risk of having more severe symptoms and added health complications. About 20% of the FSHD patients will need a wheelchair by the age of 50. At the moment there is no cure for FSHD, which is why research is so important. Zwemmen kunnen we allemaal. Maar zwemmen in open water is iets anders dan baantjes trekken in een zwembad. 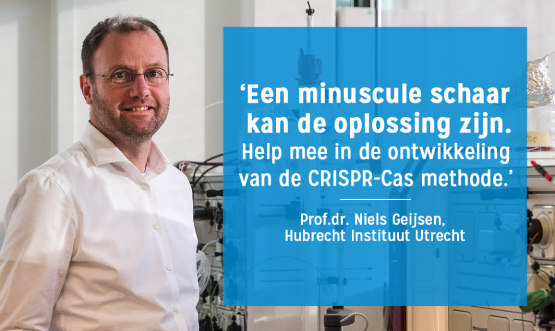 Wil je echt optimaal voorbereid in de Singel springen op 16 juni? Doe dan mee met de buitenwater training van ZwemAnalyse bij Down Under op 4 juni om 19.00 uur. ZwemAnalyse brengt je de fijne kneepjes bij van open water zwemmen. Tijdens de training wordt dieper ingegaan op veiligheid, waterkwaliteit en zwemmen in koud water. ZwemAnalyse biedt deze training aan voor kleine en grote zwemmers. 2 € 785 Mirjam Kruizinga Met spieren in actie tegen FSHD! 4 € 525 Andre junior Van der Meij FSHD de wereld uit! 5 € 375 Vincent Vrijhoef Weer meedoen voor Gea! 2 € 480 Familie Jacobs Team Familie Jacobs zwemt weer mee!